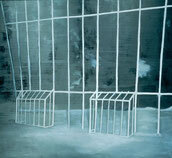 Thomas Demand > Art work more..
Luc Tuymans paints the indescribable. His dark muted scenes seem vaguely familiar, distant, like haunting memories. Drawing his inspiration from grand themes, Luc Tuymans taps into a universal social guilt: from the Holocaust, or imperialism, to child abuse. By minimalising his images, he creates a raw emotion through paint; each painting linking spiritually, somehow instinctively, to the rest. Within is a tranquil vermin metaphor for contamination and disease. A close-up detail of a birdcage, this painting more than conveys feelings of hopelessness and isolation: through its sheer size and potency, it literally traps the viewer, swallowing him into a prison of collective consciousness. 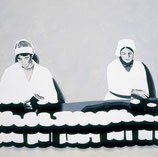 Painted from a famous propaganda image, Wilhelm Sasnal's Factory swaps the celebratory ideal of the Socialist Worker for the impersonal hardness of mechanised production. Sasnal treats painting as a reductive process: information is lost in translation from photography to painting. Using the original photo's black-and-white tones, details are eradicated through heightened contrast, the image simplified through ‘overexposure' and the intervention of the artist's hand. Wilhelm Sasnal's replicated images are dissociated from their once powerful meanings: they exist only as mere vestiges of themselves. 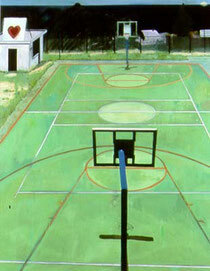 In 2002, Fischl collaborated with the Museum Haus Esters in Krefeld, Germany. Haus Esters is a 1928 home, designed by Mies van der Rohe in 1928 to be a private home. It now houses changing exhibitions. Fischl refurnished it as a home (though not particularly in Bauhaus style, and hired models who, for several days, pretended to be a couple who lived there. He took 2,000 photographs, which he reworked digitally and used as the basis for a series of paintings, one of which, the monumental Krefeld Project, Bedroom #6 (Surviving the Fall Meant Using You for Handholds) (2004) was purchased by Paul Allen featured in the 2006 Double Take Exhibit at Experience Music Project, where it was juxtaposed with a much smaller Degas pastel. This is by no means the first time Fischl has been compared to Degas. 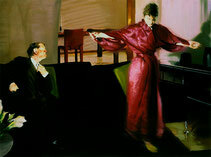 Twenty years earlier, reviewing a show of 28 Fischl paintings at New York's Whitney Museum, John Russell wrote in the New York Times, "[Degas] sets up a charged situation with his incomparable subtlety of insight and characterization, and then he goes away and leaves us to figure it out as best we can. That is the tactic of Fischl, too, though the society with which he deals has an unstructured brutality and a violence never far from release that are very different from the nicely calibrated cruelties that Degas recorded." Mulholland Drive est un film franco-américain écrit et réalisé par David Lynch en 2000 et sorti en 2001. Le film qui révéla Naomi Watts, Laura Harring et Justin Theroux, fut très acclamé par les critiques et remporta le Prix de la mise en scène au Festival de Cannes ainsi qu'une nomination à l'Oscar du meilleur réalisateur. Le film est considéré[Qui ?] comme l'un des meilleurs de Lynch, aux côtés de Eraserhead (1977) et Blue Velvet (1986). Initialement, Mulholland Drive devait être un nouveau Mystères à Twin Peaks, destiné à être diffusé sur ABC. Après moult tractations, la chaîne américaine, qui avait déjà déboursé sept millions de dollars, avait décidé de ne pas l'utiliser, effrayée par la durée du pilote (2h30) et par la complexité de l'histoire. Elle jugeait également le rythme trop lent. C'est alors que Studio Canal a contacté le réalisateur pour le convaincre de transformer le pilote en long métrage pour le cinéma. Le cinéaste a immédiatement été emballé par cette idée, et Mulholland Drive est devenu un film. Mulholland Drive se déroule à Hollywood. Une femme, Rita, devient amnésique après un accident de voiture pendant une nuit. Aidée de Betty, une actrice débutante rencontrée par hasard, elle tente de retrouver la mémoire. Une nouvelle histoire qui, comme pour Une histoire vraie, se passe sur la route. « Il s'agit du rêve de Hollywood, d'une relation entre deux filles différentes et d'un polar, avec des virages intéressants », a expliqué le metteur en scène. Photographs can seem convincingly real or strangely artificial. The work of German photographer Thomas Demand achieves a disquieting balance between the two. Born in 1964, Demand began as a sculptor and took up photography to record his ephemeral paper constructions. 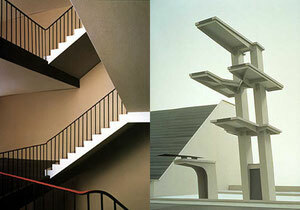 In 1993 he turned the tables, henceforth making constructions for the sole purpose of photographing them. Demand begins with a preexisting image culled from the media, usually of a political event, which he translates into a life-size model made of colored paper and cardboard. His handcrafted facsimiles of architectural spaces and natural environments are built in the image of other images. Thus, his photographs are triply removed from the scenes or objects they purport to depict. Once they have been photographed, the models are destroyed. Demand recently began to make 35mm films, setting his cinematic still images in motion. Combining craftsmanship and conceptualism in equal parts, Demand pushes the medium of photography toward uncharted frontiers. His originality has won him recognition as one of the most innovative artists of his generation. This exhibition is accompanied by a comprehensive catalogue presenting all of Demand's major works from 1993 to the present.